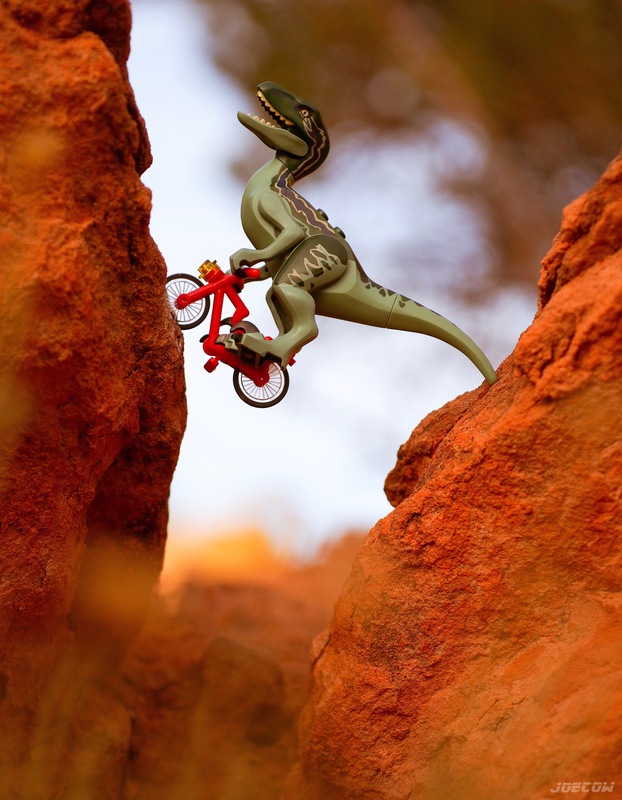 Lenny rides the Red Bull Rampage! 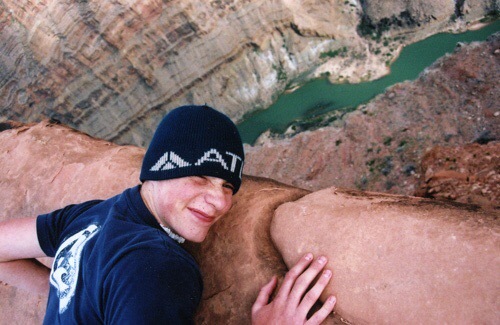 The red rock of southern Utah makes for the perfect backdrop for extreme outdoor sports. The Red Bull Rampage has been taking place in Virgin, UT since 2001 and has garnered some excellent live coverage of the area west of Zions National Park. I have had the opportunity my whole life to live in this beautiful area. I’ve explored countless dirt roads leading to so many interesting landscapes. One such experience I remember was the Mesa road just east of Virgin. The dirt road is very rough and narrow with foreboding cliffs all along the drive to the top. What was strange was near the top of the Mesa, as you drive around the bend all of the sudden the road is brand new and paved. You cannot see this change in the road anywhere on the way up. Turns out there is an old military base at the top where they test fighter pilot ejection seats. We didn’t know what it was the first time we came across it and we thought it was some secretive government base for researching aliens and ufos! There is plenty of that in utah as well. Back to the red rock. 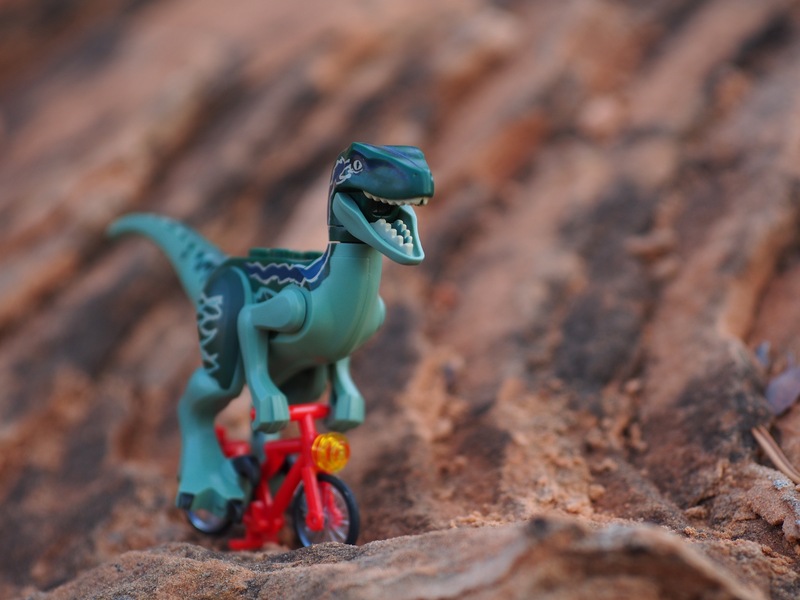 The countless cliffs and canyons and formations that make the area beautiful are also the perfect setup for hiking and biking and pretty much anything else outdoors – including my Lego photography. 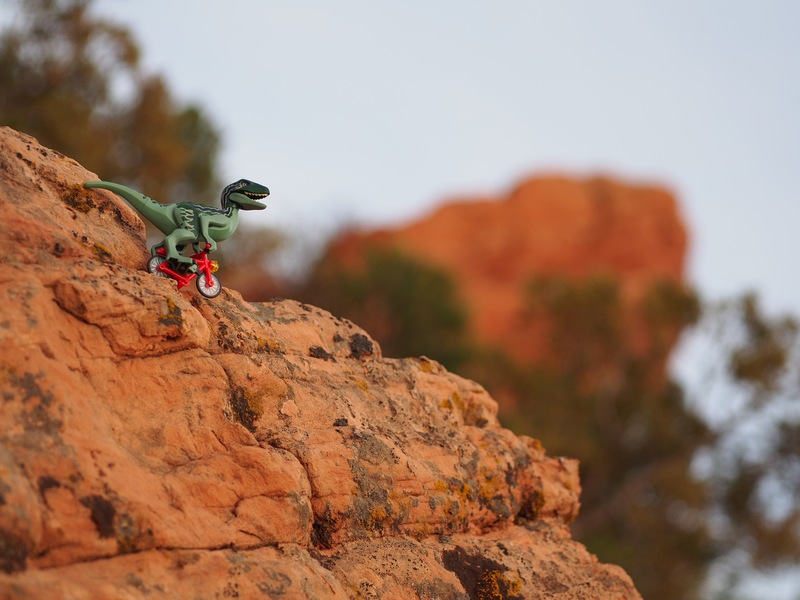 I have been busily capturing Lenny riding the redrock and have enjoyed all the close ups of the stone and red rock on a miniature scale. Something that normal folk would easily pass by and dismiss – I see as the perfect setting for Lenny to participate in a crazy death defying stunt. It reminds me of the movie, Honey, I Shrunk the Kids. The mundane of the backyard is transformed into an exotic jungle. Seemingly harmless things turn into death traps. Lenny had a few mishaps while on this shoot. Several times he fell off the minifigure equivalent of a 400 foot cliff (6 feet). Luckily his plastic posterior bounced and landed unscathed. The wind did not help on this shoot and Lenny weighing in at about an ounce it became difficult to peddle into. In fact it lifted him off the front wheel a few times and deposited him elsewhere. There is a spot near southern utah in Arizona on the rim of the Grand Canyon called Toroweap. I have yet to take Lego out to this area because it takes nearly two hours to travel the 75 miles of tire eating dirt road. This image was shot old school with my Nikon film camera before the digital age. The Colorado river 3500 feet below us! Toroweap is the location of one of the largest shear cliff faces in the Grand Canyon at around 3500 feet above the raging waters of the Colorado. 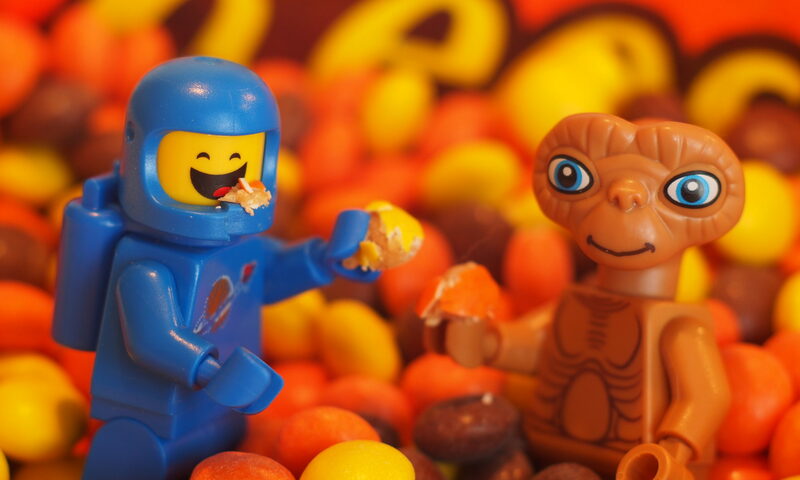 That’s the equivalent of a 168,000 foot drop in minifigure scale. Craziness. I bring up this location because of the wind. At the cliff face the wind rushes up the face at nearly 60mph on some days. We used to waddle close to the edge and put our arms out over the edge and catch the wind. The beauty and diversity of southern Utah has made me a permenant resident with my family. I have moved away at times and have lived in many different places, but the call of the Wild keeps bringing me back to this colorful country I consider home. Where do you call home? What are some of the unique aspects that keep you there? Are there unique places to photograph Lego?